Reports indicate Aston Martin is building just two examples of a V12 Vantage-based roadster to debut at the Nurburgring in May. Most automakers (European ones especially) are bringing their latest vehicles, concepts and specials to the Geneva show this week, but not Aston Martin. No, that British automaker is saving its tastiest bits for the Nurburgring 24-hour race in May. Not only will Aston be racing a hydrogen-hybrid Rapide at the grueling endurance race this year, but it also has another trick up its sleeve. 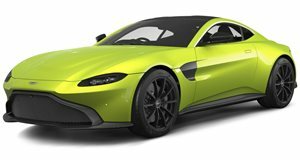 Called the CC100, it will be an exclusive roadster based on the V12 Vantage. Details at this point remain scarce, but sources indicate the CC100 - helping to celebrate the company’s centenary - draws its inspiration from the classic DBR1 with which Stirling Moss won at the Ring in 1959 – and with which Moss will be reunited in a commemorative parade at this year’s race. It will have no doors or roof to speak of, making it a genuine speedster, and an extreme one at that. Only two examples of the CC100 will be offered, with a price tag expected to eclipse V12 Zagato but fall short of the One-77.